Absentee ballot and November WIP/scrap/book/pattern auction reminder! If you will miss our November business meeting (Nov. 2 10 am-12pm), I have posted an absentee ballot here. Please download and fill out the document using Word, and return via email to Laura (lacollins AT gmail DOT com) by Friday November 7. We are voting on officers, as well as the new dues amount. Don't miss out on a chance to vote if you have to miss the meeting! If you DO miss the November meeting, you'll be missing out on a lot of fun. 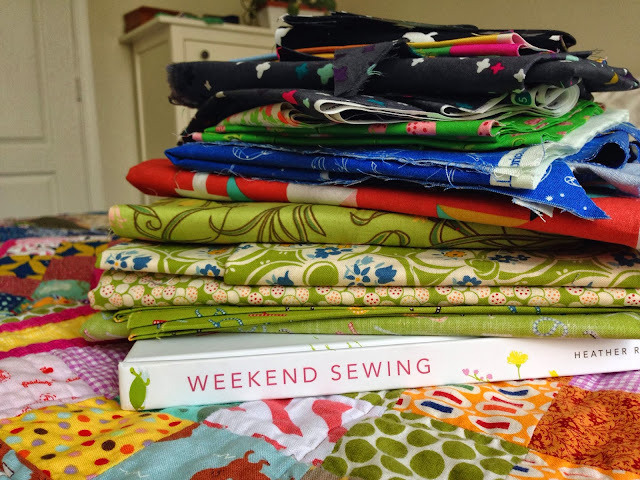 Clean out your scrap bin, your sewing room, your weird stash bits, your piles of unused craft and sewing books, your patterns...and put the stuff that's cluttering your creativity and making you feel guilty towards our guild's MQG dues! For a fun post-business meeting activity, we'll be holding a WIP/scrap pack/craft book/pattern auction. Be sure to bring about $10 in small bills to shop until you drop--or, a checkbook, if you're planning on going big! We'll auction off some of the biggest items live-auction-style, and then do rummage-sale style for the other, smaller items. On my first editing pass I pulled the pile of fabrics above (don't worry, I'll cut them down to look super-delicious, and you'll want them) and a copy of Weekend Sewing by Heather Ross (that is missing the pattern insert, so I don't use it). On October 18 the SMQG and the Boston Modern Quilt Guild were proud to co-host a lecture by Victoria Findlay Wolfe. This rare Friday-evening event gave many of us a chance to dress up a little, enjoy some evening fall-themed snacks, and soak in the inspiration provided by the talented Victoria. 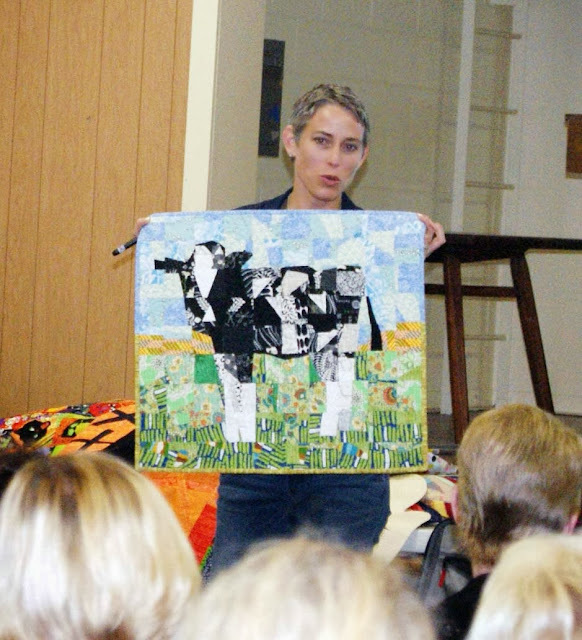 Victoria spoke for about an hour, and showed eight or ten quilts in person (many more in her slide show). The quilt pictured above is one of her "kitchen sink" quilts. She mentioned that she tries to do a kitchen sink quilt every year from a variety of leftover blocks, found vintage blocks, and scraps. Victoria's signature quilt style incorporates a lot of "made fabric"--scraps that she sews together into slabs, that she then treats exactly like yardage, cutting and re-piecing them as needed. She began her lecture by showing photographs of her grandmother's 1970s double-knit crazy quilts, and her quilts continue to show that crazy quilt influence. 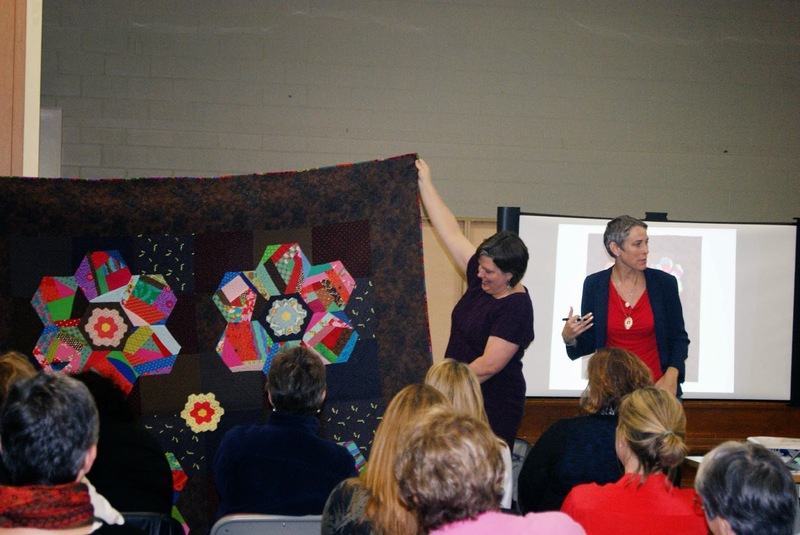 She showed a slide of this quilt, and then unfolded it--I think the entire audience was stunned to see a king-sized quilt! 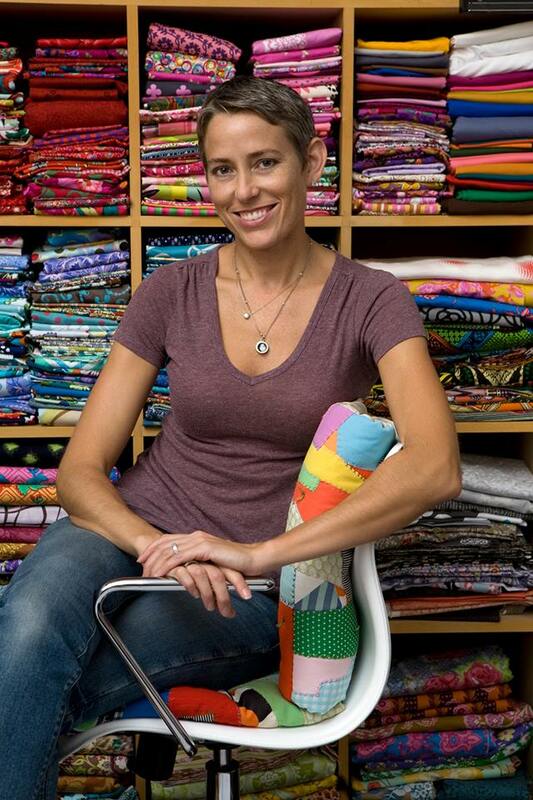 Victoria also spoke about the challenges of ugly fabrics, or fabrics outside your comfort zone. 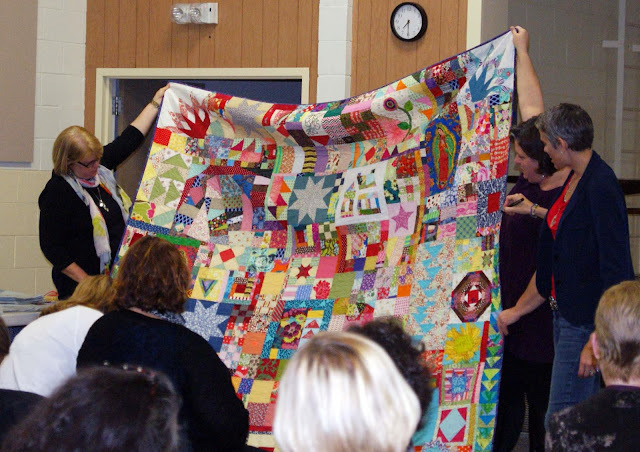 She showed quilts that mixed vintage fabrics with all kinds of batiks and modern fabrics. Try going to the area of the quilt shop you never visit, she encouraged us, and push your quilts a little further with unfamiliar fabrics or fabrics you dislike. 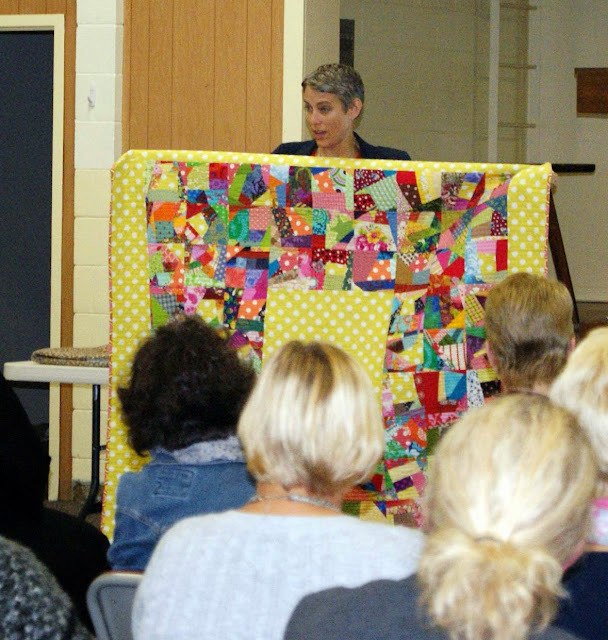 She also spoke about never making quite the same quilt twice, and always trying to incorporate a new challenge or skill with each quilt. Many people were able to purchase a copy of Victoria's book, 15 Minutes of Play. At one point Victoria even sent her quilts crowd-surfing! I left the lecture ready to dump my (shameful, stuffed-to-bursting) bag of oddball scraps and sew them into made fabric! Thanks to all who joined us for this special, inspiring event, and to Victoria, for generously letting us see and touch her lovely work and for giving such an entertaining, inspiring talk. This is a reminder that our next meeting will be our annual business meeting, held November 2 from 10am-12pm at the Stratham Public Library, Stratham, NH. If you click on the calendar link above, and then on the meeting, you can go right to a map of the location. We will be voting for new officers that will replace existing officers in January. You can see who is running if you scroll down to the October meeting recap. We also need to vote to accept the proposed dues amount of $50. Let me just remind you that we need a majority vote so please try to come. We will have our usual show and tell and then have an auction of unwanted crafting supplies, sewing supplies, etc. Please come with your donations packaged up and ready for the auction. Please also bring cash and maybe a checkbook. If you are prepared to renew your registration and pay $50, please bring a check made out to the Seacoast Modern Quilt Guild. We'd appreciate getting as many of those this month as possible. They are due by the December meeting. This is just a reminder that Victoria Findlay Wolfe is coming to speak one week from today! The lecture will be held on October 18, 2013, 7-9pm at 381 Main Street, West Newbury, MA. The lecture will be held in the Annex, the back part of the 1910 Building. Additional parking is available behind the building. Members of the SMQG and BMQG pay $5 at the door. Guests are welcome and can pay $10 at the door. Refreshments will be served. Our October meeting took place on October 5 at the Stratham Fire Station. Thanks to Paula for nimbly arranging this alternate meeting place when she found out the Stratham Library's parking lot was due to be paved Saturday morning! We opened the meeting with announcements and a few business items. Amy and Judy announced that the West Newbury bridge is open again! So, if the bridge construction was causing you travel issues, those issues should be resolved. --our guild will share projects and vote on a guild winner (winner will receive a copy of Patchwork Please!) at our January meeting. I'm so excited to see these Riley Blake fabrics in person! Amy collected a first batch of log cabin blocks for Margaret's Hope Chest. 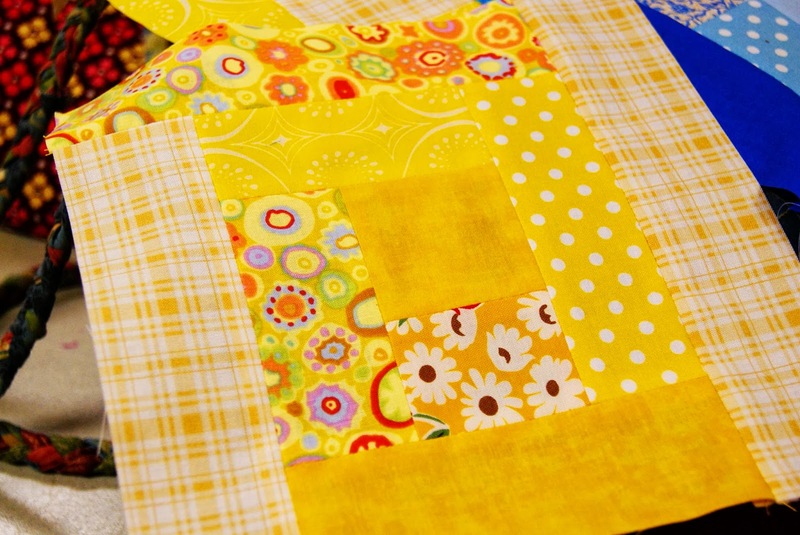 (This is one of Judy's sunny yellow blocks pictured above.) You can find details about the project and a link to the tutorial here; Amy will collect the blocks again at Victoria Findlay Wolfe's lecture on October 18. Details about Victoria's lecture are here; please remember that guild members will pay $5 at the door and any guests will pay $10. (Those manning the ticket table would greatly appreciate if you bring small bills.) Amy asks that SMQG members try to park in the back parking lot, behind the West Newbury Town Hall Annex, so that guests and people coming up from the BMQG can use the more visible front parking lot. Our next meeting is our annual business meeting. We'll be voting in the new dues amount, but to help with cash flow, Amy asked that if you are willing to go ahead and pay dues for 2014, please bring a $50 check made out to the Seacoast Modern Quilt Guild. Amy also proposed that we consider accepting a majority vote at our business meeting rather than a 2/3 majority of the membership. Debbie seconded the motion, and we agreed via a unanimous show of hands to accept majority vote. The final item of business was a fun one! Samantha and Amy have schemed up a fun way to let off steam after our serious business meeting next time--and a fun way to unload some WIPs or materials that need a new, loving home (and raise money for our SMQG kitty). Please bring any UFO's, unwanted fabric, or craft books/magazines that you're ready to unload (Amy even suggested scrap packs would be a fun item). Also bring some small cash (about $10, in small bills--or if you KNOW you're going to want to bid on a hot item, maybe a checkbook!). We'll have a live auction for the hottest ten or so items, and then do a mini garage sale for the rest. All proceeds will be donated to the SMQG bank account! Robin started off Show and Tell by showing a postcard she got at a quilt exhibition at the Art Quilt Gallery in New York City. She also showed off three WIP quilts that she is making from scraps of clothes her three daughters wore when they were little. She plans to give them to her daughters as Christmas gifts. I love how they are all such different designs, but Robin's improvisational style and color scheme unify the three quilts! Samantha showed off her BMQG challenge mini. They were given a specified color scheme and were asked to make a mini quilt to show at the Lowell quilt show. Samantha also showed off a big finish: a quilt she made for her sister! The front is DS Quilts fabrics, while the back is novelty fabrics and quotes that remind her of her sister and brother-in-law. What a beautiful gift! She's the only one I've seen use black and white prints for the interior bricks, and brightly colored skinny sashing (Stephanie said she'd seen someone call those skinny sashings "grout"!). She had even more blocks finished than she laid out on the floor, so I bet we can look forward to seeing these be a quilt pretty soon. Laura brought her spiderweb lottery blocks made into a quilt, combined with some improv log-cabin blocks. and her first quilt! This is a doll quilt she made for her daughter's American Girl doll. She hand-embroidered the little yellow x-es between the blocks. After Show and Tell, Candace gave a really informative presentation of Thermoweb's products and how to use them for applique projects of all kinds. She had lots of great ideas for using Thermoweb's fusible webs for T-shirts, the fusible vinyl for art smocks (or perhaps a tote bag lining, if your kids are apt to spill ice cream in your bag! ), and all kinds of applique quilts. She explained the proper applications for each "strength" of Thermoweb product, and noted which products are no-sew and which can be sewn through. I haven't worked much with applique or fusible products, but I left the meeting feeling confident about trying something out! Candace also brought a lot of amazing Thermoweb goodies to share. Each of us left with a yard of Amy's favorite Thermoweb product, which is Heat-n-Bond Fusible Fleece, as well as a dense roll of Thermoweb fusible web samples. Jessica won a big bundle of Thermoweb goodies to try (I saw ruler tape and some fusible binding tape in her haul) and Nancy won a DVD of a quilting show sponsored by Thermoweb. Many thanks to Candace and to Thermoweb for our goodies and for the informative demonstration! Thanks to all of you who joined us for our October meeting.